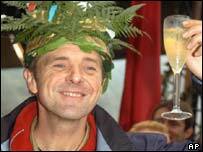 So, Tuffers is king of the jungle. Ex-cricketer Phil Tufnell rightfully emerged the public's favourite as millions of ITV1 viewers watched Monday night's finale of I'm A Celebrity Get Me Out of Here. It ended a gripping fortnight which saw tears and tantrums as 10 "stars" were planted in a remote part of Australia while the cameras recorded their every move. The celebs endured limited provisions, dodgy weather, horrible "Bushtucker trials" and, perhaps worst of all, each other's company for 24 hours a day. Geordie presenters Ant and Dec giggled at their traumas right to the end - including a hat-trick of daunting final challenges involving bugs, eels and muddy water. Some 2.5 million people took part in the final vote. But from day one, the likeable, laid-back Tufnell was destined to triumph in a show that clearly proved the thirst for reality TV remains unquenched. Of the ten original contenders, weather girl Sian Lloyd's chances were clouded by a dull front, which also hung over Coronation Street actor Chris Bisson and former pop star Toyah. Actress Danniella Westbrook and model Catalina dramatically weeped and pouted their way out of the picture. Chef Anthony Worrall Thompson cooked up an unsavoury mutiny over the food rations, while ballet dancer Wayne Sleep was just too camp for the camp. On the final night, bubbly DIY design guru Linda Barker was first of the last three to be voted out, leaving the strangely fascinating former footballer John Fashanu still in the running. Of course, in a twilight nickname world populated by Tuffers, Wozza and Sleepo, Fashanu was simply Fash. Known as Fash the Bash in a controversial soccer career that saw him successfully fight match-fixing claims, he has proved a tabloid writer's dream. At one stage, apparently, Linda admitted "she feels flush when Fash flashes the flesh". Even as the end neared, bookies reported a stash of cash on Fash, the man who declared: "I've now realised the world can carry on without me." But the hopes of Fash were dashed - and still no black person has won a British reality TV show, from I'm a Celebrity, Big Brother and Reborn in the USA to Survivor, Pop Idol and Fame Academy.